Did you ever wonder where Religio, the relief between the first and second floors on the 84th Street stairwell, comes from or when it was installed? A bit of research in the Regis archives has provided some interesting background information on this unique work of art. According to an archived document, Religio was commissioned at the time of the construction of Regis High School. A firm named Rochette & Parzini, Molders was tasked with creating the piece to fit within the architectural structure of Regis High School. The photo below, a copy of an image found in the Bostion Public Library, is the earliest recorded photo of the bas-relief. It depicts a not-quite completed design prior to the Fall 1914 opening of Regis. The photograph was found among the Boston Public Library's collection of papers from Maginnis & Walsh, the architects who designed the Regis High School building. 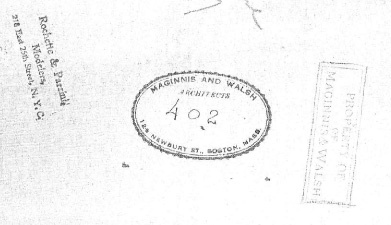 Stamps on the back of the photograph (also shown below) confirms the firms Rochette & Parzini, Molders and Maginnis & Walsh as having been involved in its creation. A more detailed overview of the bas-relief can be found in Anthony Andreassi C.O's Teach Me To Be Generous: The First Century of Regis High School in New York City. Below is a short excerpt from the book that describes some of the meaning behind the piece. It could be argued that the bas-relief "Religio," which is located on the first-floor landing of the main staircase of the school, is a good artistic representation of Regis's pedagogical foundation. Installed at the time the school was built, this curious combination of figures from classical antiquity cheek-by-jowl with Christian churchmen is clearly meant to remind students of the foundations of their Jesuit education. In 1926, then-sophomore Harry Kirwin wrote a long piece for the Regis Monthly on the meaning of "Religio Ingeniorum Moderatrix et Altrix Scientiarum Parens et Magistra" (Religion [Is] the Governor of Inborn Talents and Mother/Protector and Teacher of the Sciences). 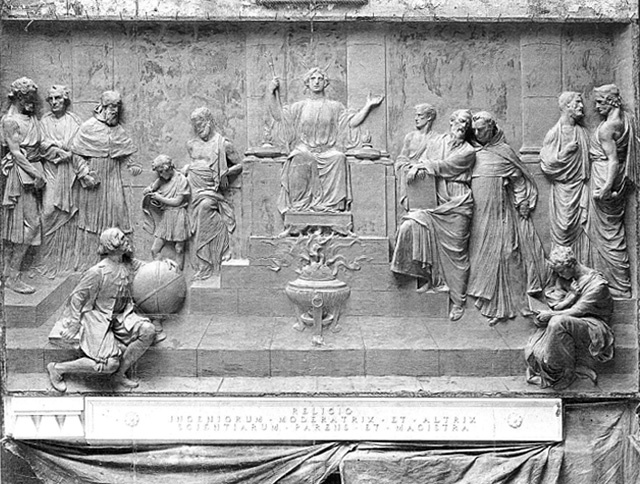 Arguing for the centrality of religion at a Jesuit school, Kirwin goes to great lengths to explain how the various figures depicted in the bas-relief represent the different fields of human learning. Nevertheless, all are gathered to sit under the abstract character of "Religion" offering each her "benevolent protection." Although this artwork was placed in a central location in the school to emphasize the importance of what it represented, ironically most students did not pass by it on a regular basis. Up until 1972, only faculty and seniors were allowed to use this main staircase. However, as mentioned above by Kirwin, the one exception to this rule at this time was for boys on their way to confession. 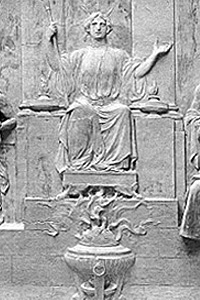 Above: A 1914 photo of the Religio bas-relief, located on the first-floor landing of the 84th street staircase of Regis. Left: Stamps on the back of the archived photograph display the names of Rochette & Parzini, Molders and Maginnis & Walsh, both involved in the creation of the Religio bas-relif.